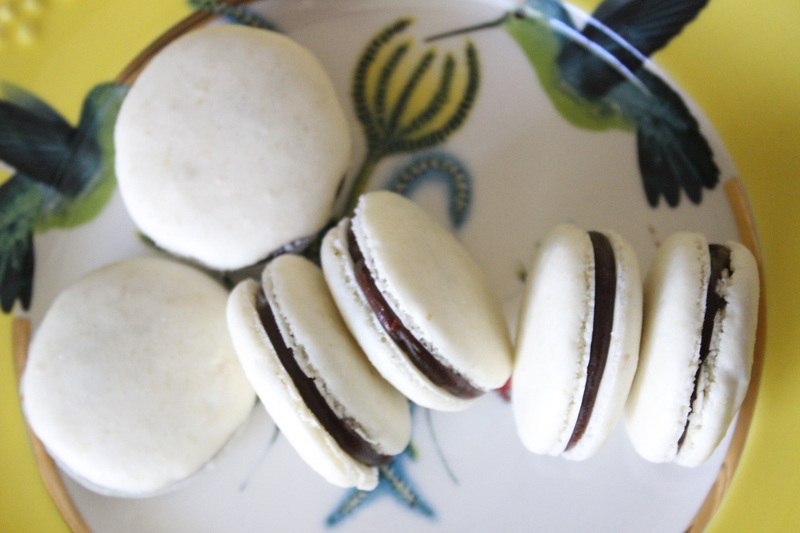 Earlier this week I began to make this macaron recipe I concocted and unintentionally almost chopped off the top third of my left index finger. Oops! Needless to say, I stepped away from the kitchen. I finally made it back to the grocery store to get some fresh ingredients this morning, just in time to hash out a last minute post. I was too excited about these for a plan B. *To crush the potato chips, place a handful between two paper towels and roll with a rolling pin. This removes some of the oil from the chips to ensure the macarons get crisp. 1. Sift together the almond flour, powdered sugar, salt and crushed potato chips. Set aside. 2. If you have a macaron silicone mat or are confident in your ability to evenly pipe the batter, skip step 2: Line 2 baking pans with parchment. 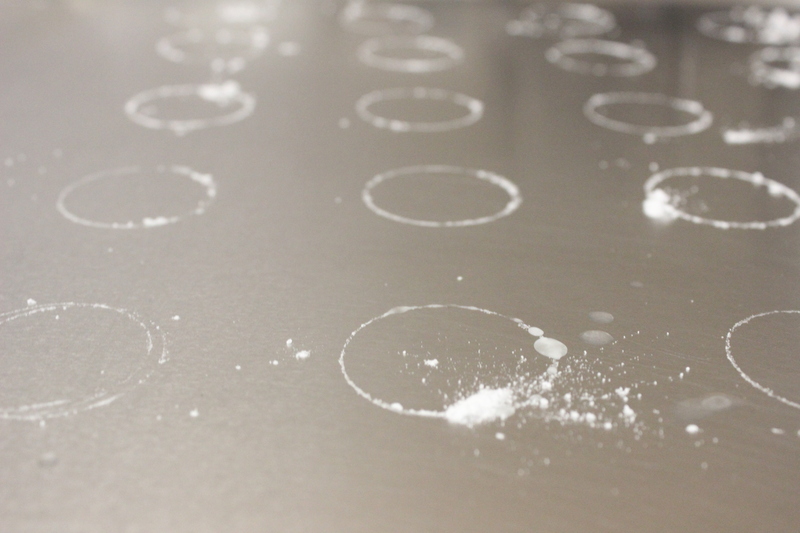 Using a small round cookie cutter (about 1 1/4 inch) dipped in water and powdered sugar, make a template for piping the macarons. 3. Whip the egg whites with an electric mixer until they form soft peaks. Slowly, while the mixer is still spinning, add the sugar. Mix until stiff peaks are formed, about 3 minutes. Fold in almond flour mixture, 1/3 at a time. 4. Pour the mixture into a piping bag with a large tip. If you do not have an icing bag, you can use a ziploc bag with the corner cut off. Pipe onto your parchment lined cookie sheets. 5. Let sit for 30 minutes to form a crust. Meanwhile, heat up your cream, pour it over your chocolate, let it stand for a minute, stir, and then mix in butter. Chill. Preheat oven to 275 degrees F.
6. Bake your macarons, one pan at a time for 15 minutes. Let cool on pan for 10 minutes, then transfer to wire cooling rack. 7. If the ganache is chilled and thick, mix in the pop rocks. 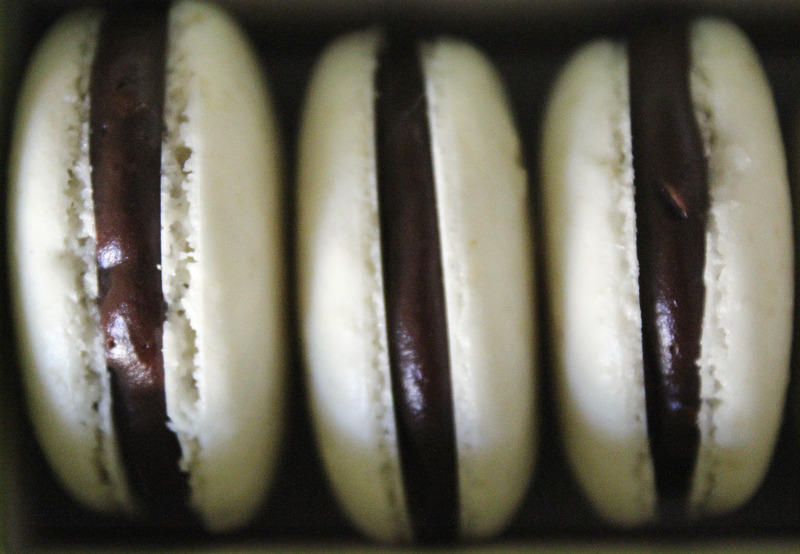 Put into an icing bag and pipe between two macaron cookies. 8. Eat them all! I love the sweet and salty mix. Oh my, these sound so yummy! Not part of your brother’s family wellness challenge, but yummy none the less! Do they keep in the freezer for say…. 2 weeks?